It has been a long time since I have been in the desert. I want to say I missed it, but when I recall my adventures in Ethiopia, I can’t say it was party time either. But as time went by, I now see this period with nostalgia. 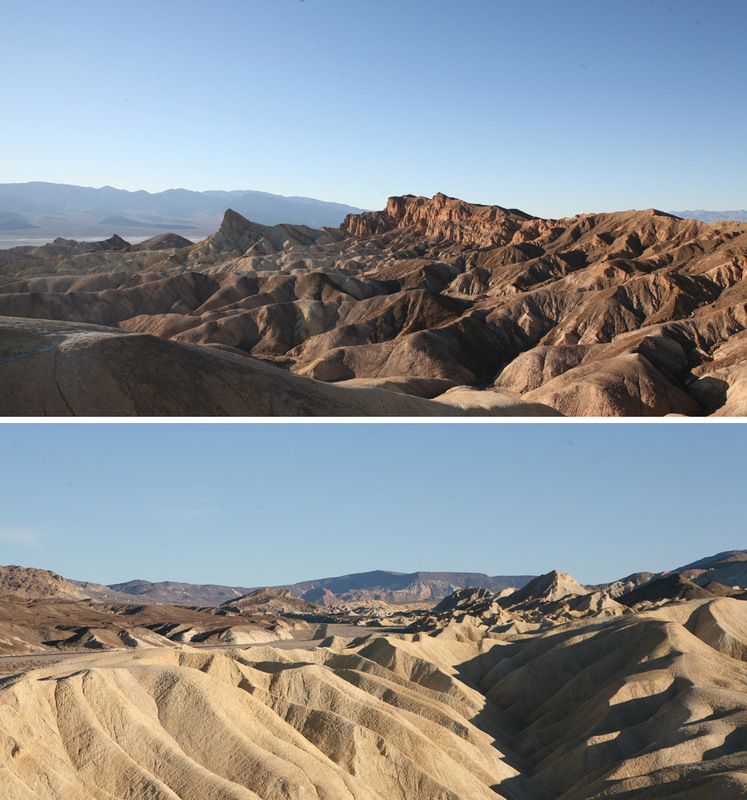 This week I was in Death Valley, and no landscape I saw so far reminded me as much as the desert in eastern Ethiopia. You can check this old post if you don’t recall my misadventures as I was trying to get through the Djibouti border. But let’s begin by the beginning. This week started with my departure from Los Angeles and a first night in San Luis Obispo. A new routine began, and I am cooking every night, trying to save cash while the temperatures are still comfortable. Of course I am not speaking about cooking amid wonderful landscape in remote areas, but more in the parking of cheap motels. Still, I am glad to use my camping equipment again. 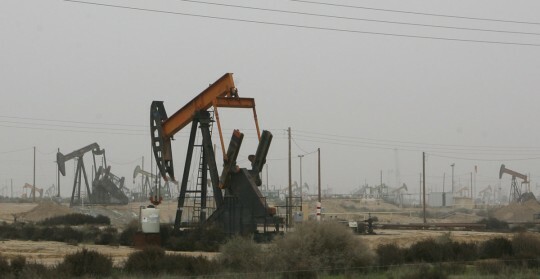 Oil field before Porterville, Ca. After a quick visit through the town, I continued my drive northeast toward Porterville, the last city before attacking the mountains. Between the cities, it is a strange area. Not much to see but endless agricultural fields, oil fields, and a dense fog as I approached the mountains’ feet. 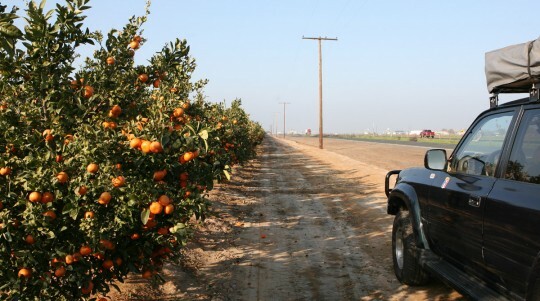 Numerous orange trees and vines can be found close to Porterville. The traveler can still be rewarded by trying one of the tacos truck along the route serving generations of Mexicans who came here to help with the hard farm labor. In the mountain, the southern part of the Sequoia National Park. I can’t say that Porterville was the highlight of my Californian adventures, and I failed to identify a true center in the city during a hike in the empty streets. Lunch break at Isabella Lake. 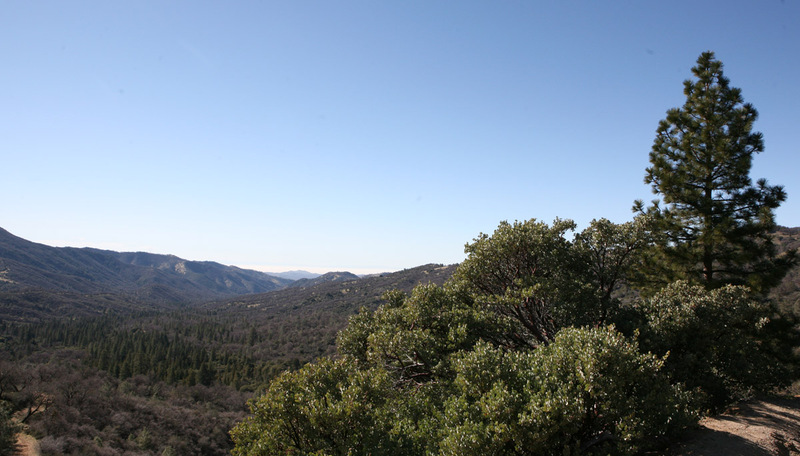 The following day, I was thrilled to go up in the mountain toward the Sequoia National Park. Unfortunately, after 30 miles up, the road was cut by snow. In the winter, snow is not cleared on this portion of the 190 going to Camp Nelson. 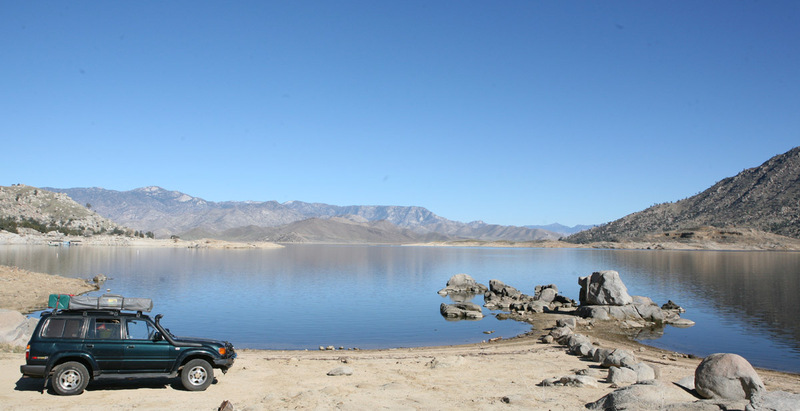 My father and I went back down the road and tried with success a more southern route to get to Isabella Lake. 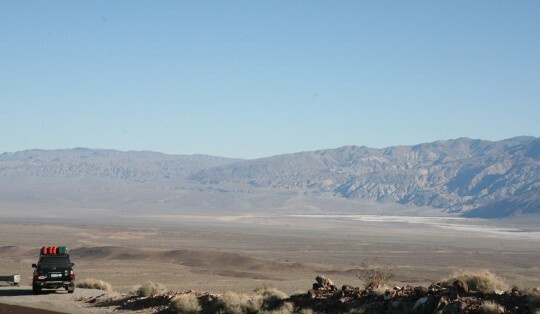 After a break there for lunch, we drove due east and spent the night in the high-desert city of Ridgecrest. All the poetry there can be found in the desert and the four mountain ranges surrounding the city. But the best was to come. 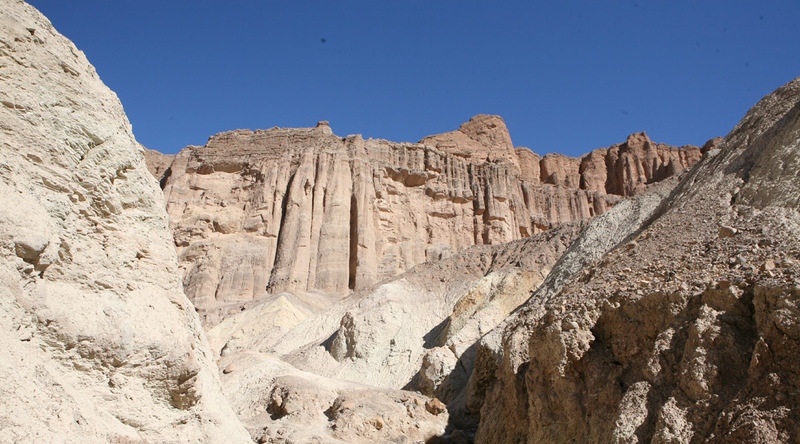 The following day, we started our trip through Death Valley, and I found myself unexpectedly back in time and living again my trip through Ethiopia. When you drive cross country, it is worth getting the National Park pass “America the beautiful”. For $80, you and your party can go for free to any national park for one year. In my case, the pass will have probably paid for itself before the end of my road trip. We took a popular route through the Valley. 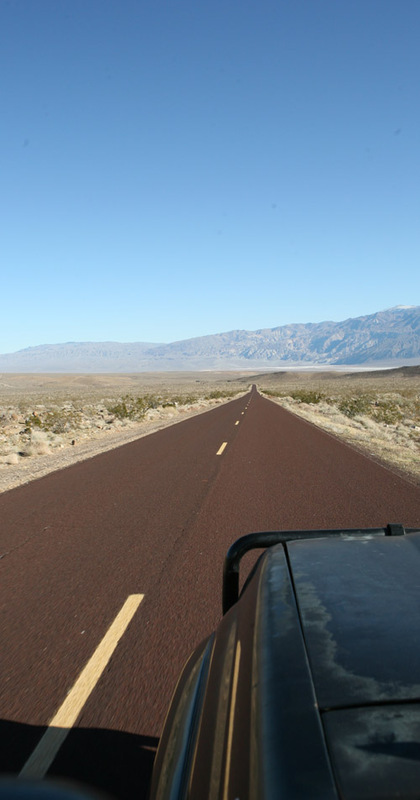 We stopped first at the sand dunes and then went south along the Badwater road, to get to the Badwater Basin. 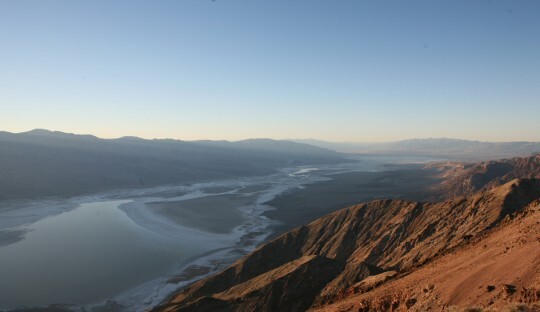 At 282 feet below sea level it is the lowest point in North America. On our way back we took the Artist’s Drive and stopped at Zabriskie Point and Dante’s View, two locations providing breathtaking views on the park’s mountains. 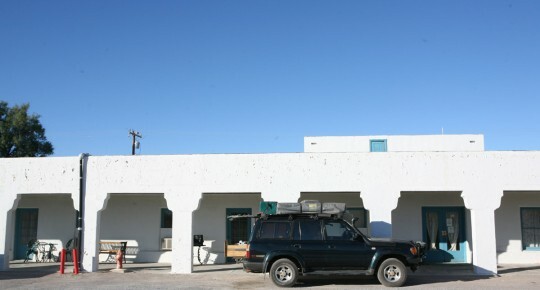 At the end of the day, after sunset, we arrived at the Amargosa Hotel, a Spanish colonial style edifice built by a mining company in the 1920s. It is listed as the top-ten haunted hotel in the country, but tired, we didn’t witness anything worth more attention than our beds. After driving few hours in the morning and crossing the state line, we arrived in Las Vegas, Nevada. I spend one more week in Los Angeles and use this time to work on freeing my truck from the Customs grip. My container arrives almost in time, but there’s no movement on the port in the week end and for Martin Luther King Day, so I have to be patient. The container is selected – again – for an X-Ray exam. This time it cost me more than $200 versus $35 in Bangkok. And it is only the beginning. 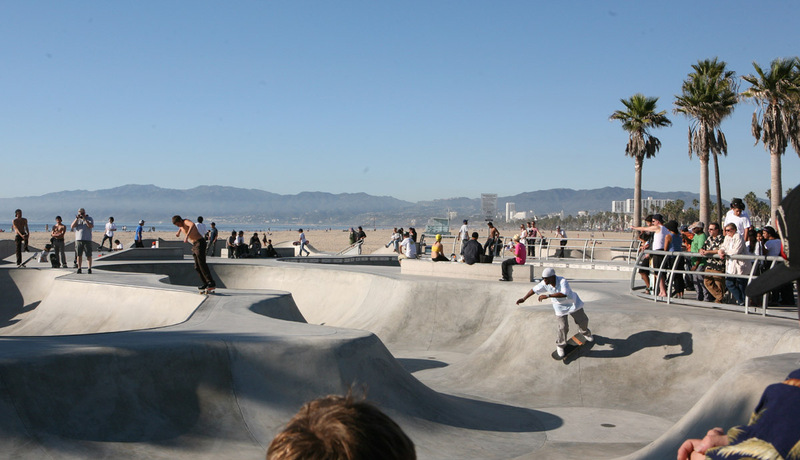 Skateboard park on Venice Beach, Los Angeles. As most container carrying personal effects, it is chosen for a secondary inspection. In these cases, you have no choice for transportation or warehouse option. You can’t be here while Customs go through your effects, and you have to let your keys at the office so they can do so. I end up paying $1,350 for this service, which bring the total cost of shipping from Thailand to the U.S. to $3,700. It is costly, but I pay without arguing, after all I am back in the Western world and have to re-adjust to higher rates. In addition, this is the last time I ship, and I am just glad to not have to deal with that anymore. My father joined me the previous day, and we continue the visit of the city with Andy. 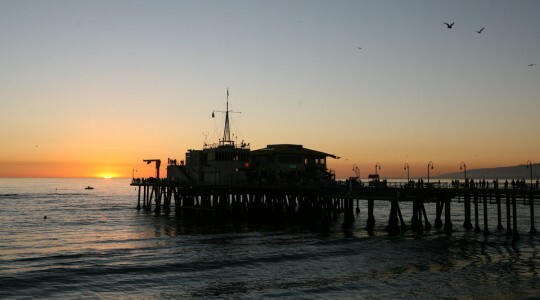 We have good time in Venice where I never went before. 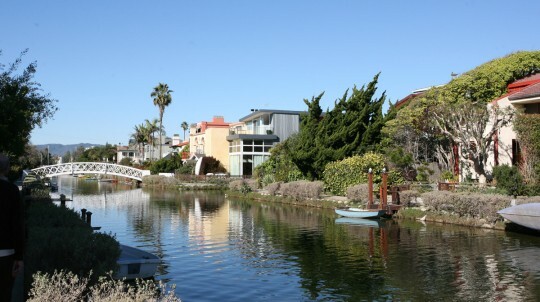 A tobacco millionaire, Abbott Kinney, intended to create a seaside resort on the marshy land looking like the Italian Venice. 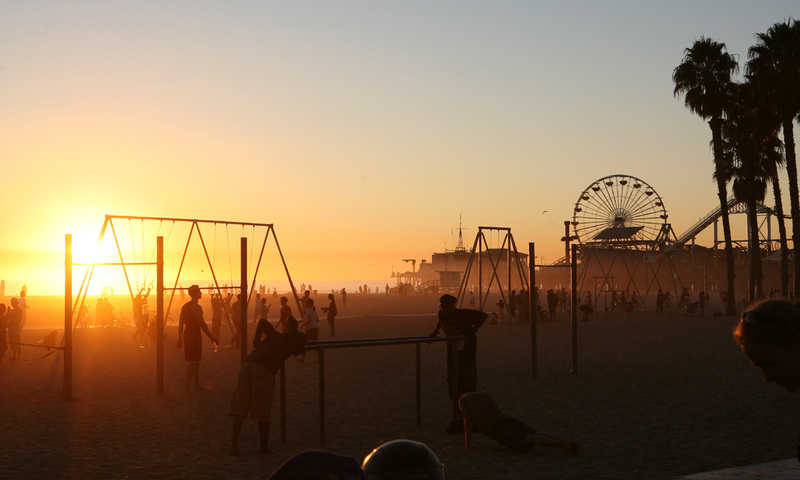 As in my previous stays in the city, I find Los Angeles to be a great place to live, and I am not looking forward to be back in snowy New York. 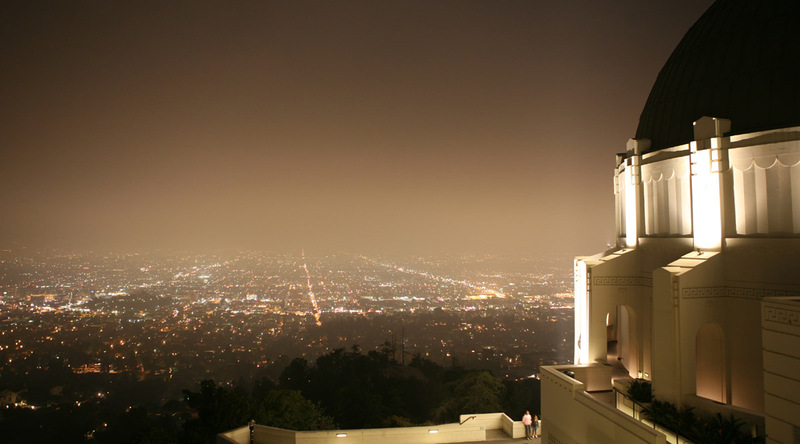 Griffith Park Observatory at night. Los Angeles underneath. In the meantime I get some work done on the truck. I put new front shocks in, since there’s 35,000 miles of bad road on them. These shocks were sent to me by ARB while I was in Djibouti (Thanks Jim!). The truck seemed very tired when I started it for the first time in the Customs warehouse. After few minutes running, it was getting better, but I still will need a bit of luck to go across the country and drive the 4,000 miles it involves. The power steering pump is leaking badly, and I hope it can hold until I get back. There will definitely be some work to be done on the truck at this time. 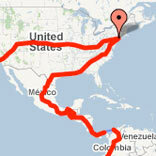 I also work on planning the next stages of my trip. I decide to go up north the Californian coast to San Luis Obispo, go east toward the Sequoia National Park, continues to the Death Valley and all the way to Las Vegas where I should stay for the week-end. There, I plan to meet some of my followers and Gwenaelle and Max, a couple of French friends I stayed with when I crossed Texas a year ago. This 900-miles promenade across California should be interesting and features many incredible landscapes that I am excited to discover. Being back on the road is always electrifying. Surfer on the coast along the Pacific Coastal Highway. Now that my father is with me, I will have to sleep at motels on the way back home and I book some Travelodge and Motel 6 nights through the internet. At $40 to $50 a night for two people, I find these chains to be the cheapest option and an excellent way to go cross country. Of course it will turn out to be the most expensive segment of my world tour. 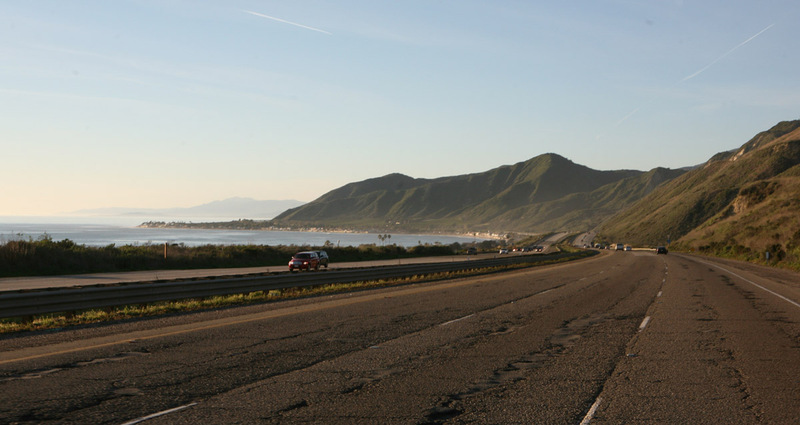 The Pacific Coastal Highway, one of the most enjoyable roads in the U.S.
On Monday morning, I say good-byes to Andy and Michelle, my wonderful hosts for the time I spent in L.A. It was nice to stop there, relax, and accept that I was back for good in the country. 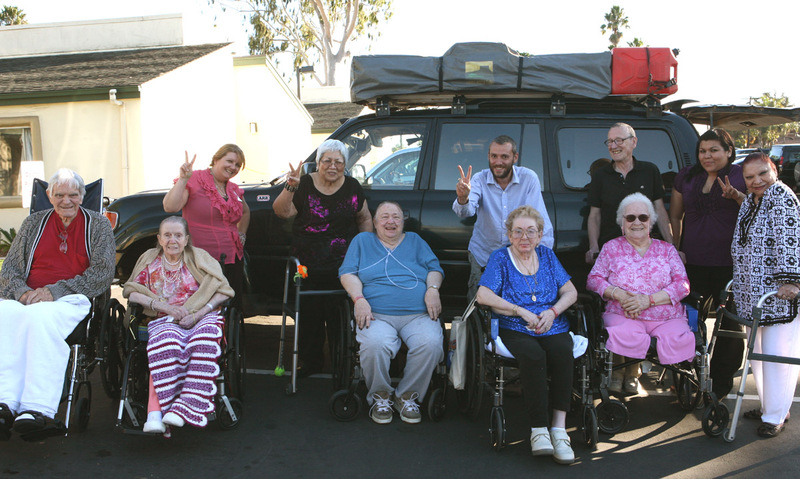 I drive up the coast, and stop at the Glenwood care center in Oxnard, which is home to some of my oldest – in every sense of the word – followers. The folks at the Glenwood Care Center. My father is at my side. They stayed abreast of my adventures and sending me emails since I left the U.S. and I can now say without taking much risks that the elder of my fan is 103 (as of today). 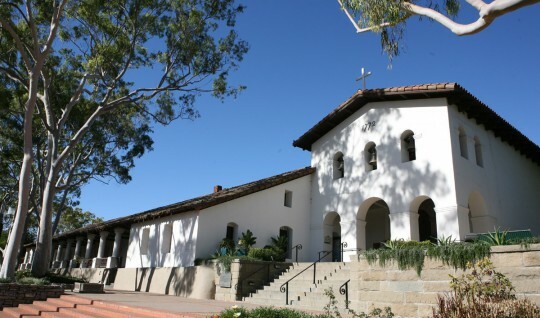 I spend two hours there and continue my drive up to San Luis Obispo. If anyone wants to meet on Friday night in Las Vegas, just email me or post a comment! 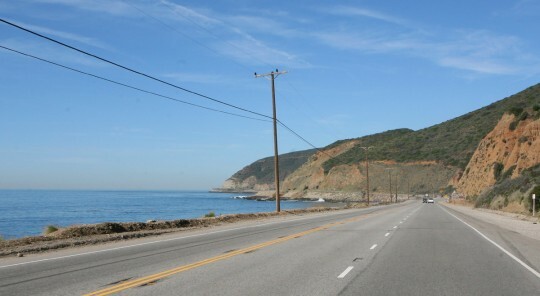 The Pacific Coastal Highway further north.